"A Seattle-style version of the French favorite, Salade Nicoise." Boil the new potatoes for about 15 minutes in salted water, till they are just cooked through (you can run a sharp knife through one) but not falling apart. Drain completely, and then cut into bite-sized chunks. Place in a large bowl and pour half of the dressing over them. 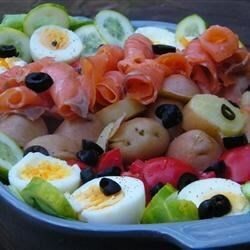 Add the egg wedges, beans, olives, tomatoes and salmon chunks. Drizzle vinaigrette to taste, then salt and pepper as desired. Gently stir together and serve warm.